Well, the old axiom is certainly true—you can take the boy out of the country, and oh yes; you can take him out of the woods, too. Ahh, but from that day forth and forevermore, is the adventuresome spirit deep in the heart of that lad ever truly far away! And so it was surely destined to be…that the old Nomad would venture forth again, returning to the country and the woods, back to that mysterious, ever-winding, far-off trail. 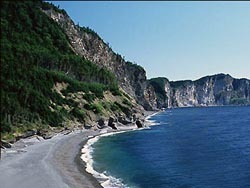 For on June 3rd, National Trails Day, even earlier perhaps if the ice goes off the tundra in those mystic, far-away Chic Chocs, will he be standing in the sea at the base of the spectacular Cliffs of Forillon, Cap Gaspé, Quebec Province Canada. From there will begin an incredible journey: “Odyssey 2000,” a trek o’er the backbone of the entire Appalachian Mountain Range from the Gulf of St. Lawrence where the most-ancient of the Appalachians plunge dramatically to the sea, thence, and from there, way down south to near Porter Gap, where these venerable old mountains spend their winter in Alabama. 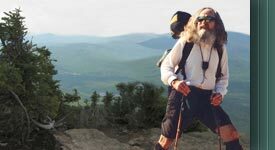 This trek would be the first recorded southbound thru-hike o’er these ancient and spiritual mountains. At the end of his intended trek, Nomad learned that he hadn't actually hiked the entire Appalachian Mountains. 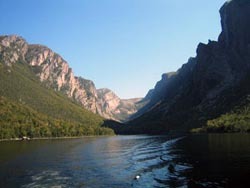 Friends pointed out to him that the Long Range Mountains of Newfoundland are actually a part of the Appalachian Mountain range. Not being one to leave things undone and itching for new ground to stomp, Nomad later flew to Newfoundland. He then put a new feather in his cap as the first to hike ALL of the Appalachians, as he completed the journey through the Long Range of Newfoundland. © Copyright 2005-2016. All rights reserved.